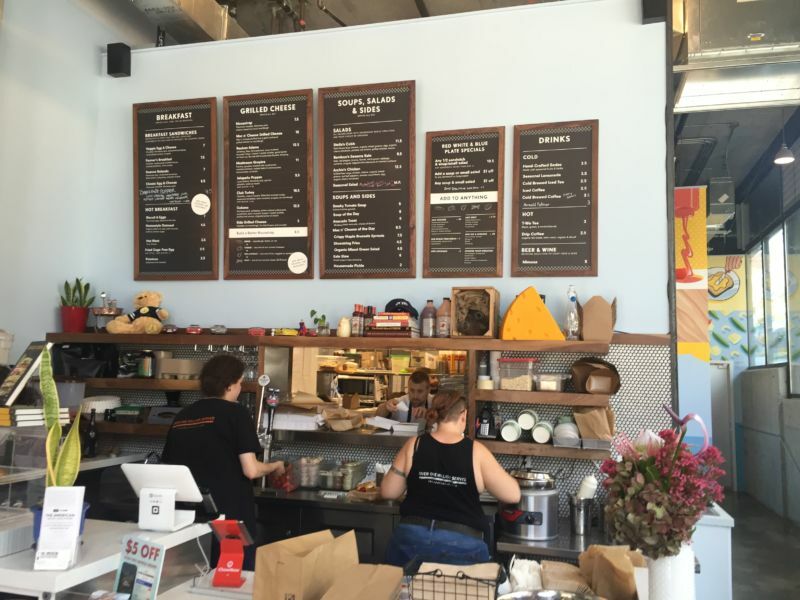 The American Grilled Cheese Kitchen has a couple of locations in San Francisco. The one that I am reviewing is at Broadway and Battery. I will take a couple of detours before I start talking about the restaurant or the food. For our non-US readers there is a common American way of describing the location of a building by giving not only the street on which it is located, but the closest cross street. In this instance the restaurant is a corner building, with its entrance on Battery Street. This location method is useful, especially for long roads or where the numbers on buildings may be tricky to see. The second aside is for those readers who do not live in the area. Locals tend to call San Francisco “The City”, with the definite article implying that no other cities are as deserving of note as San Francisco. I have lived here long enough to have acquired this habit. I apologize if in future posts I inadvertently use that affectation. Note that I shall never refer to The City as San Fran or Frisco. Short of wearing a Dodgers shirt there is no better way of being on the receiving end of disapproving stares than using either of those names. Back to the subject of the post. The restaurant is small, with a handful of tables and stools. I work a block away; so on all of my four visits I have taken my food to go. The observant among you may have an idea of my rating of this place already; four visits being three more than I would do for a place that was poor or even average in a city full of eateries. 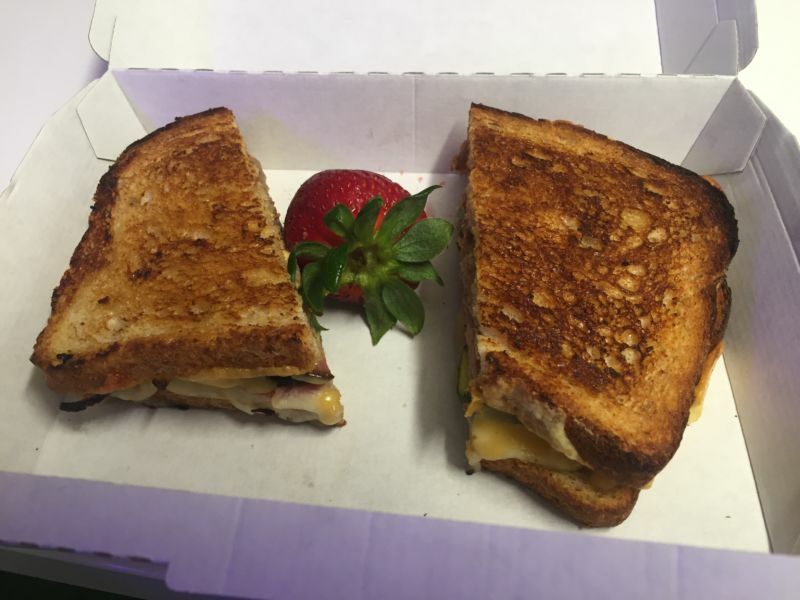 The menu is, unsurprisingly, focused on grilled cheese sandwiches; they also serve salads and soup. The latter being a standard pairing with their signature items. Their “basic” sandwich is called The Mousetrap. I used quotes, because even their simplest item is a tasty blend of three flavourful cheeses: Tillamook cheddar, creamy havarti, and Monterey jack. They are served between two slices of excellent sourdough bread. They offer a build your own option; with the excellent name of Build a Better Mousetrap. I tried this by adding ham; as the name implied this was even better than the original. On my third visit, I branched out further and ate the Club Turkey. This sandwich has cheddar, creamy havarti, smoked turkey, tomato, mustard, and argula. With this one the cheese is sharing the limelight with the other ingredients, but it still felt like a grilled cheese sandwich. On my recent visit, I went for The Cubano; Monterey jack, jarlsberg, cocoa rubbed pulled pork, cured ham, stone ground mustard, bread n’butter pickles, pickled red onions, chipotle butter on levain. This no longer felt like a grilled cheese sandwich at all. It was, however, an excellent meal. The pork was tender, the mustard subtle, and the pickles were probably the best I have ever tasted. Were it not for the appeal of the comfort food that is a grilled cheese sandwich, I suspect that The Cubano would become my regular at this place. The staff add a strawberry to each dish. This has cosmetic value and since it is fruit it enables me to claim that I am eating healthy food. California Girl Comments: This is a long way from the grilled cheese sandwiches I grew up with as a kid: sliced white Wonder Bread, margarine, and sliced American cheese fried in a pan. This was served with Campbell’s cream of tomato soup. At the time, I thought that was delicious. Times have changed. I have grown up and so has grilled cheese.